To enable newstickers to access the internet, a proxy must be activated. 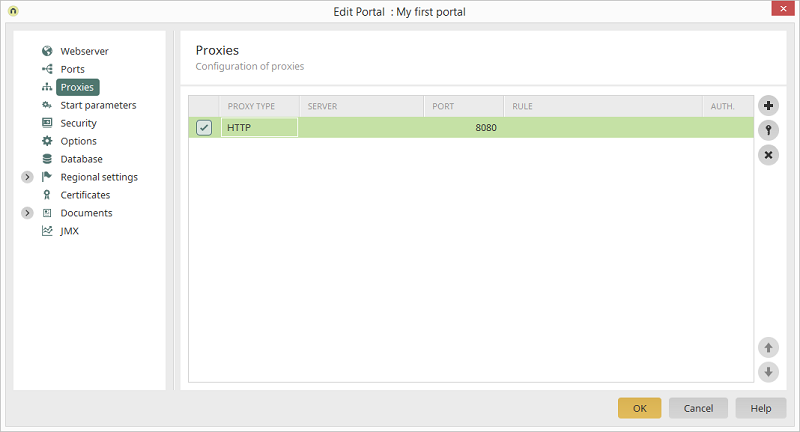 Clicking in the first column will activate or deactivate a proxy. For all other Intrexx functions, a proxy only needs to be activated if, on your network, access to the internet is controlled via a proxy server and/or no direct connection to the internet is possible. The setting always refers to the path from the Portal Server. Select the "Proxy type" in the second column. Selecting the entry "<none>" in the proxy type drop-down list means, that for the entered URL pattern no proxy will be used. In the third column, enter the server name or the IP address. The port must only be changed if port 8080 is already in use. A list of rules can be entered here with a comma-separated list which are then routed through the proxy. At least one of the rules must apply. With the wildcard *, everything will be routed through the proxy. http://server\\.tec\\.example\\.com:4444/services. * accepts exactly the URLs that begin with http://server.tec.example.com:4444/services. http://server.tec.example.com:4444/services. * accepts exactly the URLs that begin with http://server.tec.example.com:4444/services. http://.*/services/. *_" accepts exactly the URLs that begin with http:// and contain "/services/". Make sure you define the rules in such a way that they only apply in the cases for which they are intended. Otherwise, this could lead to unexpected behavior - e.g. using the rule "http://*" means that URLs from the local computer (e.g. http://localhost:8983) are also affected - which is usually not intended. Adds an additional proxy to the list. Removes the highlighted entry from the list. Opens the Proxy Authentication dialog.